A few years ago, when I first attended Syngenta`s Forum for the Future of Agriculture I found out about the TFF Challenge, a competition aimed at students of all levels that has set an objective to “feed 9 billion by 2050” by unleashing the creative potential of youth in designing innovative solutions for ending world hunger. At first, I was angry. I wasn`t a student anymore. I always loved to participate in case study competitions, innovation challenges and the TFF Challenge was exactly what “I was born for”. But, at that time, I was just finishing my PhD thesis so the next year I would have been eligible anymore to participate. But nevertheless I wrote to the organizers saying that I want to be involved in the competition somehow. This year I had the opportunity of becoming a mentor in the TFF Challenge. I was assigned 4 of the 93 teams that have successfully signed up by April 8th for Round 1 of the competition. And they were great teams. I saw firsthand what youth, enthusiasm, technical knowledge and lots of brainstorming could produce. With completely different approaches and backgrounds, my teams have brought in the TFF Challenge innovative ideas on how they think we should end world hunger. Team Agrilution from the HAS Hogeschool (Netherlands) is promoting Vertical Farming, having developed a system that takes into account the need for increased yields in a world with ever decreasing arable lands. How you ever heard of Aeroponics? Agrilution explains how this works perfectly on their team page. Team Biota comes from VIT University in India. Their idea is not only simple, but also brilliant. Team Biota proposes to decrease agricultural inputs (such as energy costs) through the use of an innovative solar energy collection and distribution system through the use of automated bots that will be directed towards agricultural producers in rural India. Ingenerovictus taps into the power of mobile applications and that 1 billion/year food waste through an innovative credit system that already drew the attention of the private sector. Coming from IIT Roorkee in India, Ingenerovictus has developed an Android application (already available) through which people who donate food waste receive discounts at partner stores (that already exists and many more will follow). The food waste will be transformed into manure/compost and distributed (for free) to farmers, thus decreasing the costs of agricultural outputs and market-shelf food products. Ingenious! The Inventor`s Guild is my US based team from Rensselaer Polytechnic Institute, New York. Their approach is based on the diversity of food sources available in the world being supported right now by major organizations. They are saying why should we continue to eat 10 types of crops (wheat, maize, potatoes, tomatoes etc.) and 5 types of meat (pork, chicken, beef etc.) when there is such more great food out there. The Inventor`s Guild project is everywhere on the internet. Just Google MealsGoneWild and you will find them. Between May 1st and 10th an online voting on the TFF Challenge website will send 5 of the 93 teams from Round 1 to Round 2, where they can create a “pilot” for their project in order to prove its feasibility in front of the judges in the big final in Berlin in September 2013. It was my honour to be a mentor to these fantastic teams, to see their ideas grow and their projects come alive. I`m glad that my advice and support helped them reach this point in the competition and, if it would be possible, I would vote for all four teams in a blink of an eye. But, because each person gets only one vote (through their Facebook account), I will not vote. I cannot choose between them. I consider them all great and worthy of participating in Round 2 and the big Berlin Final. 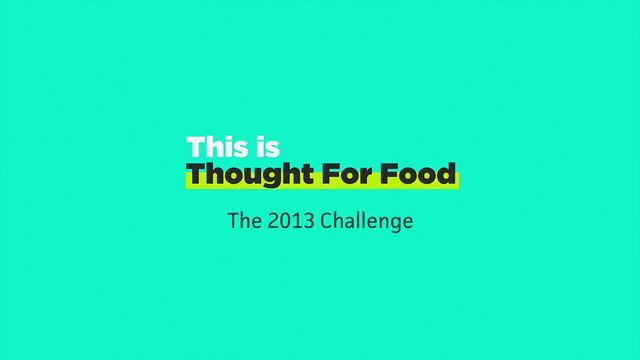 Check out the TFF Challenge website and vote for one of the teams you consider that has a groundbreaking idea. Update: It seems that I was wrong. You can vote for more than one team. Agrilution, Biota, Ingenerovictus and The Inventor`s Guild got each a vote from me today.